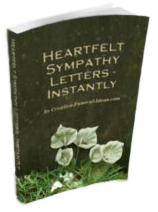 Want to express the personality of your loved one, for one last time? Finally - a green solution for reducing our carbon footprint, that wows. 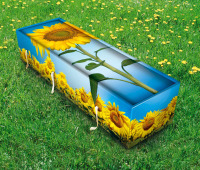 These distinctive designed cartonboard coffins provide for a more eco-friendly funeral. 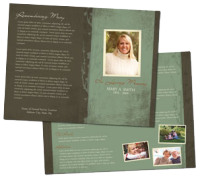 More importantly, the range of styles will help you find a design that truly reflects the personality of your loved one! The designs range from quirky and humourous to dignified and beautiful. Most popular is the sunflower coffin. Other styles, include the golfer's coffin, a gerber flower, a guitar coffin, Sergeant Pepper's Album cover coffin, and a wine bottle, Choose from these styles. Nowadays, the average wooden coffin sells for $3000. Eco-coffins, however, sell for a fraction of that amount. You can add a unique, creative touch to your service. And make a difference to the footprint we leave behind. Read why green burials are so important. 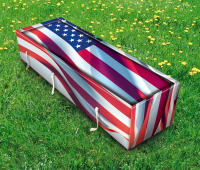 These environmentally-sensitive coffins are certified non-toxic. All coffins are made from cartonboard materials produced from unbleached pulp containing at least 60% recycled paper, plus wood pulp from sustainable forests. Only natural starch-based glues are used in assembly - no nuts, bolts, screws, tape or other fixings. The handles are made from natural woven cotton. The ink is vegetable-based. The patented design of the casket allows for a dignified and beautiful appearance which does not cause undue pollution or take up excessive amounts of valuable trees. Each cartonboard coffin weighs under 22 pounds (10kg) which drastically reduces shipping costs, also further helping to reduce the carbon footprint and environment impact of the funeral. Made out of Compakta™ these cartonboard coffins are suitable for both burial and cremation. Funerals are an extremely personal occasion. 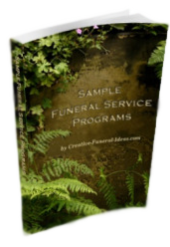 You can provide the funeral home with your coffin of choice. See purchasing coffins online.